RECENTLY, a few well-meaning New Yorkers stopped to check on a crying baby in an abandoned stroller and got seriously spooked when a hideous demonic baby shot straight up from beneath the blankets. 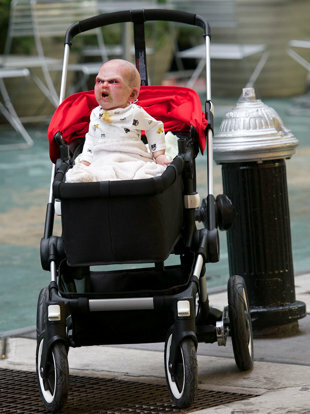 Fortunately, the grotesque “devil baby” wasn’t real, it was simply an animatronic one rolling around in a remote-controlled buggy for an elaborate hidden camera stunt to promote the upcoming horror flick, Devil’s Due. This stunt is the work of a viral marketing company called Thinkmodo, the same group who created the very popular promo for the remake of the movie, Carrie.